The most common arguments for reducing the 35 percent federal tax on corporate income usually revolve around the fact that having the developed world’s highest tax rate on business undermines competitiveness and reduces investment in America. And all of that is true. But we should never lose sight of the fact that the corporate income tax is merely a collection device. Businesses may pay the tax, but the real burden is borne by people. Shareholders (investors) receive lower dividends. Consumers pay more for goods and services. Workers receive lower levels of compensation. Politicians don’t really care about investors since some shareholders are rich, but they definitely pay lip service to the notion that they are on the side of consumers and workers. So I think this new study from German scholars is worth sharing because it measures the effect of corporate taxation on wages. Here are some of the highlights. In this paper, we revisit the question of the incidence of corporate taxes on wages both theoretically and empirically. 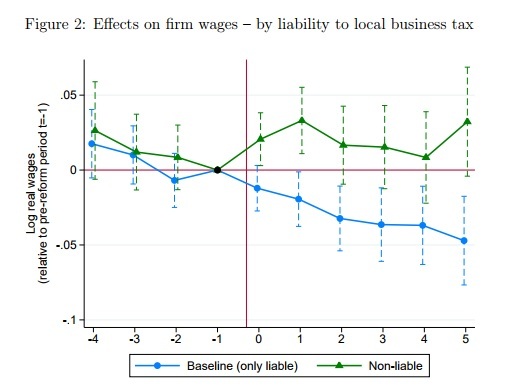 …we exploit the specific institutional setting of the German local business tax (LBT) to identify the corporate tax incidence on wages. …we test the theoretical predictions using administrative panel data on German municipalities from 1993 to 2012. Germany is well suited to test our theoretical model for several reasons. First, we have substantial tax variation at the local level. From 1993 to 2012, on average 12.4% of municipalities adjusted their LBT rates per year. Eventually, we exploit 17,999 tax changes in 10,001 municipalities between 1993 to 2012 for identification. 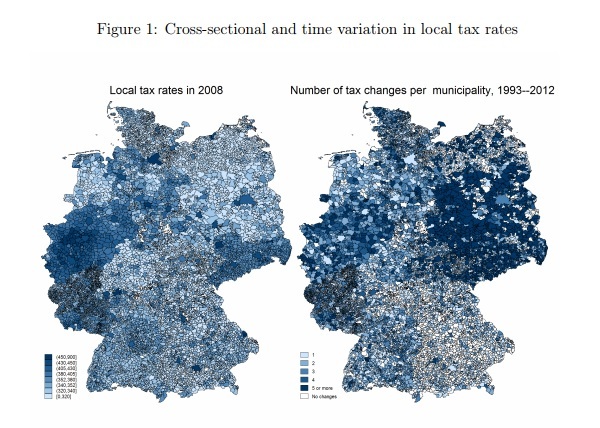 …Moreover, the municipal autonomy in setting tax rates allows us to treat municipalities as many small open economies within the highly integrated German national economy – with substantial mobility of capital, labor and goods across municipal borders. And here are the key results. There’s a good bit of economic jargon, so the main takeaway is that 43 percent of the corporate tax is borne by workers. For our baseline estimate, we focus on firms that are liable to the LBT. Figure 2 depicts the results. Pre-reform trends are flat and not statistically different from zero. After a change in the municipal business tax rate in period 0 (indicated by the vertical red line), real wages start to decline and are 0.047 log points below the pre-reform year five years after the reform. The coefficient corresponds to a wage elasticity with respect to the LBT rate of 0.14. …this central estimate implies that a 1-euro increase in the tax bill leads to a 0.56-euro decrease in the wage bill. …we have to rely on estimates from the literature to quantify the total incidence on labor. If we assume a marginal deadweight loss of corporate taxation of 29% as suggested by Devereux et al. (2014), 43% of the total tax burden is borne by workers. This finding is comparable to other studies analyzing the corporate tax incidence on wages (Arulampalam et al., 2012; Liu and Altshuler, 2013; Su´arez Serrato and Zidar, 2014). …We find that part of the tax burden is borne by low-skilled workers. …the view that the corporate income tax primarily falls on firm owners is rejected by our analysis. For what it’s worth, I use a different approach when trying to explain the impact of the corporate income tax. I state that shareholders pay 100 percent of the corporate income tax when looking at the direct (or first-order) effect. However, since shareholders respond to this tax by investing less money in businesses, that means productivity won’t grow as fast, and this translates into lower wages for workers (compared to how fast they would have grown if the tax was lower or didn’t exist). This is the indirect (or second-order) effect of corporate taxation, and it’s akin to the “deadweight loss” discussed in the aforementioned study. And this is also the approach that can be used to calculate the damage to consumers. For today, though, the moral of the story is very simple. A high corporate tax rate is bad for growth and competitiveness, but one of the main effects is that workers wind up earning less income. So when the class-warfare crowd takes aim at “rich corporations,” there’s a lot of collateral damage on ordinary people. P.S. For more information, here’s a video from the Center for Freedom and Prosperity that describes some of the warts associated with the corporate income tax. P.P.S. There’s lots of evidence – including some from leftist international bureaucracies – that a lower corporate tax rate won’t mean less tax revenue. …oh yes and then you try to bring back prosperity by repatriating middle income country type jobs. Middle income jobs beget middle income country prosperity. So now all employees, not only those subject to corporate taxation, will have to pay an additional 4% tax on everything they buy. How is that any better? In the end it’s the same: if it’s confiscated by the community then it’s confiscated, it doesn’t matter how. You get your money back through mediocre state services after the government middleman has taken his cut. End result: less economic efficiency, less motivation, less growth, less compounding prosperity. The world leaves you quickly behind. seems to be indeed in order of decreasing elasticity. Shareholders, who are increasingly both domestic and international, will seek the highest reward to risk ratios for their already earned money. Since taxation decreases reward without decreasing company risk, taxation simply drives shareholders to the stocks and investments of other jurisdictions. This is not theoretical, it has been happening and will be happening. After all this is one of the reasons behind the financial drive to have an international diversified portfolio. High elasticity, thus few corporate taxes are borne by shareholders. Consumers are elastic but not quite as elastic as shareholders. For some services there are no international alternatives. But for the many products and services for which there are imported alternatives, taxation simply drives consumers to the international alternatives. Medium elasticity, therefore some corporate taxes are borne by consumers, especially poorer consumers. The only captives, that is, those who have no alternative but to work under the domestic laws of corporate taxation, are the employees. Therefore they are the ones who pay the lion’s share of the corporate tax through lesser salaries. And because corporate taxation has always been there, employees do not know what their salaries would have been had there been less corporate taxation. Elasticity is minor and only achievable through immigration. Of course the least internationally mobile employees, that is the most captive employees, are low income employees. So what if the business portion of the payroll taxes (7.65%) were replaced with an approximately revenue neutral 4% VAT? No change in dividends, no change in consumer prices (since VAT replaces payroll previously passed through); but U.S. workers would become more attractive. Would it be terribly wrong to simply help workers without directly helping the owners?